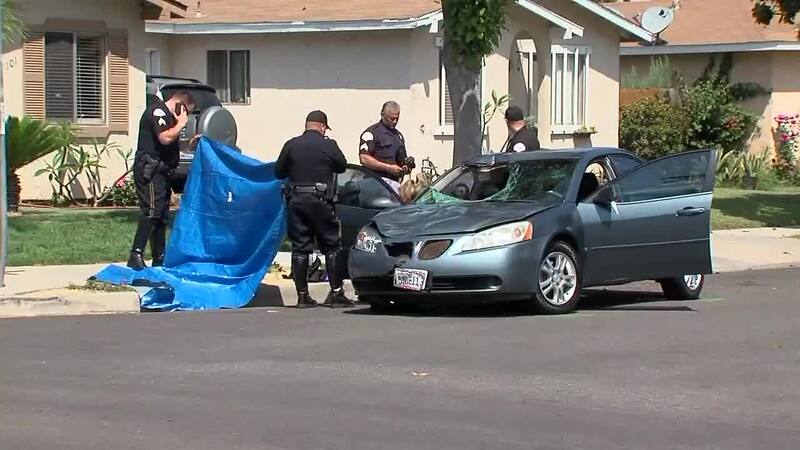 OCEANSIDE, Calif. (KGTV) - When Oceanside Police officers showed up to a report of a car crash on the morning of June 27, 2016, they were missing a lot of pieces. “We knew that’s not where our crash scene was,” said Ofcr. Bryan Hendrix. They had found a car with a broken windshield, covered in blood. Inside, a man’s body had been crumpled under the passenger’s seat, mutilated from the apparent blunt-force trauma. “You could tell that the pedestrian had basically hit and ridden up the hood,” said Hendrix. The force was so great, the man’s shoes and pants were ripped off and part his left leg was sheared off by the roof of the car. “It landed in the back dash where people sometimes put stuffed animals,” described Hendrix. But there was no glass or debris in the area. A witness had told police he saw the driver park the car and walk away, but had not seen the crash. That’s where Hendrix and the Oceanside Major Accident Investigation Team (MAIT) stepped in. Within a few minutes, they were able to find the original crash site more than a mile away. “We don’t get all the pieces handed to us ahead of time, so we have to walk around,” said Hendrix. After the initial sweep, they found tire marks leading onto the curb, the back windshield to the suspect’s car, and victim’s pants, shoes and ID. The victim's name was Jack Tenhulzen. But then they have to map it out, a meticulous process that often goes unseen by the public. They’re able to reconstruct digital 2D or 3D models and use physics to determine what a driver's speed or direction was at the time of the crash. They’re also tasked with creating a pre-crash profile of the driver’s previous 24 hours. In this case, they found the driver, Stacy Sanchez, about an hour after the crash. She had walked away from the car but was later found at home a few blocks away. Even at that point, Hendrix says her blood alcohol content was twice the legal limit. They started working backward, finding surveillance video from the motel she was partying at and interviewing people she interacted with. Hendrix said, one of her friends offered to call her cab but she declined. He said her husband also called her and she told him she was too drunk to drive. Sanchez was sentenced to 15 years in prison.